The Gay Gamer: Is the WonderSwan remake of Final Fantasy III finally going to be released? 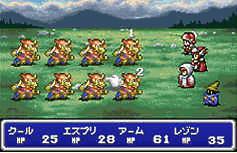 Is the WonderSwan remake of Final Fantasy III finally going to be released? Sadly, the most likely answer to that question is "no." For those of you who've never heard of the WonderSwan remake of Final Fantasy III, here's the deal: Shortly after the folks at Bandai unveiled the WonderSwan Color in 2000, the folks at Square announced they were prepping enhanced remakes of the first four Final Fantasy games for the system. aborted WonderSwan Color remake of Final Fantasy III. Why is that ill-fated Final Fantasy III remake once again a topic of interest? Well, late last week a number of gaming sites revealed that the game will soon be released for the iPhone. The question is, will it be a straightforward port of the Famicom version of the game, a reworked port of the aborted WonderSwan Color version, an iPhone-friendly port of the DS version or something altogether different (such as an enhanced, two-dimensional remake a la the PSP versions of Final Fantasy I, II and IV)? I don't know about you, but I'm guessing the third option mentioned above is the most likely, with the last coming in a close second. So do you own a Wonderswan? I have a Swan Crystal with a copy of Final Fantasy IV, and, they're pretty rad. Hey there Suika! No, I don't own a WonderSwan, sadly enough. I've thought of buying one from time to time, to play these FF remakes and a few other games, but I've just never gone ahead and done it. I was wondering about this too! Personally I don't think it would be the DS version but then that basically leaves them with the Wonderswan game or original... I doubt they'd really go from the ground up with a full on remake just for iOS. You never know though! I kind of doubt it's the DS version, too, but that does seem to me the most likely possibility. The ground-up remake would make a lot more sense if they were working on a PSP version, too -- which, who knows, maybe they are? I guess we'll know soon enough, as the game's supposed to be released in March! The WonderSwan Color has a pretty terrible screen. It's impossible to see except under a desk lamp, and the contrast knob is so sensitive that it goes from white out to pitch black in an eighth turn. Don't get me wrong, I love the thing. But having no back light on a full color screen is pretty inhibiting. Yeesh, that's not good news! I'm not sure you'll see this comment, but in case you do: Is the SwanCrystal better in this regard?